Summer is here! Problem magazines are teeming with originals at this time, composed during the long, cold winter months, whereas most of us are thinking about ways to stay cool! This month we feature miniatures (the problem equivalent of the bikini swimsuit? ), the “fun” problems with seven pieces or less, as they are “take it to the beach” accessible, and often can be solved – or at least attempted – right, from the page. So print out this month’s problems, and take them to the beach or the lake or wherever you like to spend your hottest days and have fun solving! (For any housekeeping announcements, see solutions). Deadline for solutions for this column is in four weeks on August 13. There are 31 possible points. Mention miniatures, and the name Bob Lincoln pops up immediately. In an era when we are told that there is nothing new possible in the two-mover, and that every miniature is surely anticipated, here we have someone who specializes in what must be the impossible: the miniature two-mover. But just as true chessplayers know that chess is not “solved,” neither is the problem domain – it’s not that there is nothing new to be found in the two mover or the miniature – it’s just darned hard! But with these next two “king in the corner” problems (another area supposedly with nothing new), Bob makes it look easy. Bob said luck was on his side, but I’ll quote Capablanca here: “The good player is always lucky!” Well, so evidently, is the good composer. He notes his key retains the set mates, but it’s also a compelling key, and as in all “Lincolns,” set play and tries are very important. If you miss those, well, you’ve missed over half of the nice content Bob brings to every effort. If you are an OTB player, and you tell me that “you still don’t like problems” because they are unnatural in some way after you see this one, I give up. The key is natural, but beautiful, logical, and relentless, leading in the lines to a nice use of all four corners – in a two mover. The black pieces can only defend again one threat, while opening up another, no matter how they try to defend. Bob wins awards all over the world, so evidently I am not alone in liking his problems. Here the key could almost be described as brutal, yet again, logical, unrelenting, and beautiful. I love sweeping queen keys, so that is a small hint here (so many possible sweeps! ), as well as miniature problems in which black has promotion possibilities. It must be the possibilities available with the birth of a new piece, one that is not already on the board. When there there are multiple possibilities based on multiple promotions, the value of the problem grows. A wonderful problem that came out of the Arbeiter Schach (Worker’s chess) movement that was part of both communist and non-communist Europe. My friend Mirko Degenkolbe of the former East Germany was a part of this movement, and he is still proud to call himself both worker and chess composer. More on him in just a minute…. Mention the word miniature in problem chess circle, and along with Bob, our “national hero,” the name Kozhakhin comes up. In the specialized world of chess miniatures, they are the modern day Fischer and Spassky, and like those two other greats of the chessboard, seem to enjoy a very friendly relationship. Kozhakhin, the Russian publisher of the problem magazine devoted to miniatures Kudesnik, composes mainly moremovers, and he also has a very talented young daughter who composes. Two main mates after the key, and don’t forget the tries….. I requested Mirko send me some of his best miniatures for this column. Mirko edits the two-mover section for Problem-Forum, a very interesting German magazine that really is a Forum for the discussion of various problem types through originals and solver commentary; he’s multitalented, best known these days for his long helpmates. I call him “Gandalf” as he never ceases to amaze me with what he can conjure up! This one is praiseworthy for the tries involved, as is the next one. I also enjoy these kind of zugzwang problems, as they are light, rely on general chess principles, and can be solved from the diagram. This effort, which relies mainly on your ability to count, comes out of the book Polski Miniatury, available as a pdf at http://www.problemista.pl/images/stories/archiwum//polskieminiatury.pdf. We end with my pal Mirko again, a very nice six mover that impressed the Ukrainian IM Evgeny Bogdanov, the judge, very much. It’s probably the hardest of the bunch, but worth spending your time on while you bask in the sun’s rays….. Solutions and comments based on those provided primarily by master solver Anatoly Goldberg, for a useful look into his thought processes. We had fewer comments this month – not because people didn’t want to, but the problems were very hard, and even some experienced solvers had trouble with notation, with all the rook doublings…. I think we’ll have more again this month, and some of the composers of these problems have provided me with their views, which should make for interesting reading. The ladder has been promised for some time, and will arrive soon. In the meantime, I am also working to get the results transferred to the MSA, where ratings of all kind are shown, and thus, solvers will have the same option to find their “solver’s rating” along with their OTB ratings….. Since our comments are a little thin this month, I thought I would discuss a comment made by Josh Green, a talented young composer in his own right, about “such a strong move” being used as a key in a previous column. Here I will have to part ways with Josh: the key must indeed be the strongest move on the board – else it would not lead to the desired result! But I understand what he was saying: it was an apparently strong move, and keys should not (usually) be so apparent. But often the choice of key, as in the miniatures above, is between many strong moves, it is just that all, except for one strong move, fail, and should fail in a way that is unique and not apparent at first glance. 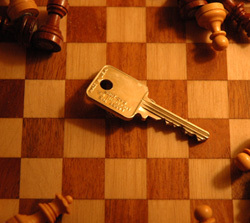 But if we think that every key must be masked, we fall into the “worst possible move” as key, or as Graham Brown notes in this witty little article, “The most stupid move”: http://www.khcc.org.uk/gb.htm. The article and the example problem given are worth a look, and the article is amusing because he assumes that a knight to the rim must be a stupid move – however, take some time to consider why it is not! And of course, my disagreement with Mr. Green’s comment does not mean it wasn’t worth making – in fact, I found it to be an interesting point which deserved further comment. It should be noted that this is the pioneer problem showing the famed Brunner-Turton doubling maneuver.